The Government paper starts with a subtle lie: “This paper looks at the potential models for the UK’s relationship with the European Union, if there were to be a vote to leave”, it states. In so doing, it actually offers a highly selective view of a limited number of options – by no means all of the , potential models. And it is putting a negative spin on the consequences of the limited number of options it does discus. Pre-eminent amongst the omissions, of course, is Flexcit, despite downloads of this two-year-old plan now having reached 48,000. That is the way the Government, as with the Remain campaign, intends to play it. It doffs its cap to the unworkable options and, despite the referendum being the people’s choice, ignores the only crowd sourced plan in existence – the one that happens to be workable. Nevertheless, while they think they can ignore us – alongside the leave “noise makers” (a foolhardy mistake) – we don’t ignore them. Knowing our enemy is what gives us much of our strength. Thus, for the rest of the day (and following days), we will be analysing this second Government paper of the week, pointing out the good, the bad and the lies.Looking at the text – and starting with the executive summary – if the Government thinks it is trying to deter people from voting to leave, it needs to try harder. Much of what it seems to think is the downside merely comprises statements of the obvious, which we’ve long conceded in Flexcit.Thus, when the Government tells us that, “regardless of the preferred outcome that the UK seeks, the precedents clearly indicate that we would need to make a number of trade-offs”.This is precisely what we have been saying for more than two years. We are not going to get a swift “clean” exit. To get inside the two-year Article 50 deadline, we are going to have to compromise. That we should have to do so is a given.If the authors of this paper cared to read Flexcit (which they probably have), they would have noted that we say, in effect, that “in return for full access to the EU’s free-trade Single Market in key UK industries, we would have to accept the free movement of people”.The Government presents this as if it was something new and terrible. Yet that very issue is at the core of Flexcit. In order to maintain access to the Single Market, pro tem, we will have to take on board free movement. You can read this in Flexcit, page 122, where it says: “it is unlikely that the EU would settle for any formal free trade agreement without some provision for freedom of movement”.Only the rabid wing of the leavers fail to recognise this. For the rest of us, as part of a phased withdrawal from the EU, we can accept continued free movement as the temporary price for a swift exit. We can also better deal with migration outside the EU – even within the EEA. While Mr Cameron has to go cap in hand to the Commission for his incredibly weak “emergency brake”, EFTA states within the EEA can unilaterally invoke “safeguard measures”, which far outstrip the minimal (and unenforceable) concessions given to the UK.The Government then goes on to tell us that access to the Single Market would require us to implement its rules – as if this was something new or special. But of course we would have to implement these rules. This should go without saying. To sensible leavers, this isn’t even an issue. What we didn’t adopt though the EEA, we would repatriate anyway. The day after Brexit, all EU laws would continue in force. Only gradually, would we redefine the rule book and, since so much of EU law is now of global origin, we would end up keeping it anyway. According to the Government, though, from outside, the UK would no longer have a vote on these rules. But inside the EU, we get seven percent of the vote on the Council, while the vast majority (over 3,500 instruments a year) of laws are placed on the A-list and go through without voting anyway. Then, outside the EU, the UK would have a vote. We would restore our voting rights on international and regional bodies, where most laws start their life and, through the EEA, we would have a veto to block any EU laws that we don’t like – if we decide to accept new laws, which is by no means automatic.Before leaving the Norway option in this preliminary assessment, the FCO tells us that there is no guarantee that we could fully replicate our existing cooperation in other areas, such as cross-border action against criminals. This is very much the style of the document – innuendo is rampant. But there is no reason why we should expect to continue with any number of cooperative arrangements. Norway does, Iceland does. Why would the UK no do so? Finally, before moving on, we get these good and faithful Civil Servants artfully tell us that full access to the Single Market would require us to continue to contribute to the EU’s programmes and budget. But hey! We know this already. All of this has been explored fully in Felxcit, and there is no problem with it. We divorce the political ambitions from the cooperative programmes, and there is a price tag that goes with it. What we don’t get from these gifted public servants is any suggestion that the this is anything other than a possible end game. There is no hint that this could be an interim solution and there is more to come – that there more then just the dead end of a Norway emulation. As always, it is not what they say, it’s what they don’t say. Next in line, though, is the “Free Trade Area” option. We’ll look at that in Part 2. 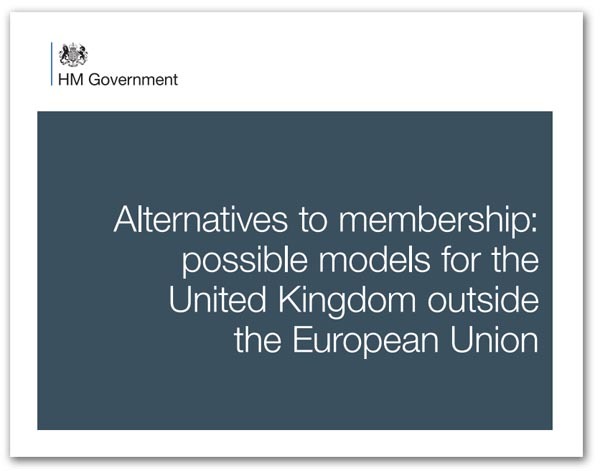 Following the publication yesterday of the Government’s paper on the alternatives to EU membership, we return to the fray with our continued analysis. Yesterday, we were looking at the Government’s “take” on the Norway option. Predictably, it highlighted the downside and, equally predictably, it omitted to mention that the main advantage of this option is its use as a halfway house, to give us a swift exit from the EU within the two-year Article 50 timeframe. The end game (or part of it) then becomes the creation of a genuine, continent-wide European Single Market, as originally envisaged by Winston Churchill in 1948 – the year I was born and nearly ten years before the Six decided to opt for the EEC, eventually dragging us 27 other European countries into a cul de sac from which we must now escape. The details of this end game are set out in Phase 3 of Flexcit, with Chapter 11 starting on page 215 referring. This vision far transcends anything Mr Cameron has to offer with his “special status” and is one that is eminently achievable. But it is only when you treat the Norway option as an interim measure, and sketch out the real end game – which takes in the abolition of the EEA and its replacement with an agreement managed (on our behalf) by EFTA, under the umbrella of UNECE – that an exit plan begins to make sense. And this is why, of course, the Government insists on casting the Norway option as the final cover, something we do not advocate, and have no intentions of seeking. But then, the last thing we can expect the Government to do is fight our case for us. This we must do ourselves. Moving on from the Norway option, the Government paper next addresses what is calls “negotiated bilateral agreements”. Here, it is on much firmer ground, telling us that “a bespoke UK-EU trade agreement would be complex to negotiate”, adding that, “the EU-Canada agreement, for example, has taken seven years to negotiate and is still not in force”. This is an issue we have addressed many times on this blog, most recently here, pointing out that there are few examples of the EU being able to complete a trade agreement inside five years. Yet, on the very day that the Government published its report, we had Lord Lamont in the Telegraph declaring that “talk about Norway is irrelevant”, then grandly stating that “Britain would have its own arrangement suited to our circumstances”. Undoubtedly, in the fullness of time, Britain would have its own arrangements. But what we have here is a blank refusal to acknowledge the time limitations imposed by Article 50. If we had open-ended negotiations, then we could go for a bespoke agreement. But we haven’t. Worse still, if we run out of time, and are force to leave without an agreement, the effects would be catastrophic. The question that the likes of Lamont must address, therefore, is whether they are prepared to take the risk of a failure to reach an agreement, or whether we should hedge our bets. Making this even worse, though, Vote Leave is still dickering over the validity of Article 50. In a bizarre intervention by Nigel Lawson, we see him resorting to public schoolboy rhetoric, dismissing claims of free trade, etc., negotiations taking 10 years or more as “balderdash”. He argues that the only constitutional requirement for the UK to leave the EU is the repeal of the 1972 European Communities Act. Thus, he states, in the event of a vote to leave, we should invoke the Article 50 mechanism, or some alternative route. This brings us back to Monday’s report, where the Government unequivocally stated that Article 50 “is the only lawful way to withdraw from the EU”. If Vote Leave is not even prepared to accept this statement, then it is no wonder that it cannot get to grips with the folly of seeking to negotiate a free trade agreement. But even in this, there seems a total disconnect. Should the UK – following the guidance of Vote Leave – decide to ignore Article 50 and seek negotiations with the EU on a free trade agreement, prior to leaving the EU, how would it expect the EU institutions to act? As far as the EU is concerned, it requires a legal base for any action and it has available to it either Article 48, on treaty amendment, or Article 50. In any circumstances, Article 48 would be out of the question, which would leave the European Council to invite the UK to invoke Article 50. If the UK then refused to invoke this Article, there would be a stand-off. No progress would be possible. But if then the UK repealed the ECA, thereby unilaterally abrogating the treaty, the consequences would be catastrophic. And still, without a legal base, there is no mechanism for the EU then to enter into talks with its errant Member State. In fact, no British government would ever contemplate bypassing the treaty procedure, so Article 50 is a fact of life – a done deal. It is pointless arguing the toss, in which case we take the two-year limitation as read. And, with no guarantee that negotiations for a free trade agreement could be concluded within two years, it would be foolhardy even to consider this route. With that much said, the Government is actually kicking at an open door, as it makes its case for the unsuitability of the free trade option. In making its case, it adds that there are additional hurdles to an agreement, in that – as a “mixed” agreement – it could require the agreement of all 27 of the remaining EU Member States, as opposed to QMV for an Article 50 agreement. Thus, a single state could block it, putting the UK in an extraordinarily vulnerable position. The next point it makes is that no existing bilateral trade agreement would deliver the same level of access that the UK currently enjoys to the EU Single Market. In particular, none provide equivalent access for services, which accounts for almost 80 percent of the UK economy. And that is actually a good point. Even the comprehensive Canadian agreement has exceptions and limitations. It runs to 1,600 pages – yet the Single Marketacquis comprises around 5,000 separate statutes, far more than the Canadians have adopted. With the degree of economic integration between the UK and economies of the rest of the EEA, anything less than complete access to the Single Market would involve economic penalties. There is then the possibility of the Swiss option. It has a higher level of access that does Canada and other free trade partners, but once again we’re having to accept freedom of movement and make some contributions to the EU budget. However, there is an issue here that we explore in great depth in Flexcit, which is referred to in the Government report. “It is unlikely”, it says, “that the UK could secure an arrangement like Switzerland. Even if we wanted to do so, it is unlikely that the remaining EU Member States would be willing to offer the UK a similar arrangement”. The point about the Swiss deal, of course, is that it was cobbled together after the Swiss people, in a 1992 referendum, refused to let the federal government join the EEA. As such, it isn’t really a considered model – more an ad hoc series of agreements with no underlying cohesion. Without in any way over-egging the situation, therefore, the government is able to say that the EU-Swiss bilateral agreements are complicated, and increasingly controversial both with the EU and in Switzerland. Furthermore, both the EU and the Swiss are calling the viability of this model into question. In 2010, the Council of the EU described the model of EU-Swiss relations as “complex and unwieldy to manage and [it] has clearly reached its limits”. In any case, the web of bilateral agreements between Switzerland and the EU has taken many years to negotiate – 22 years in all. Once again, the Article 50 limitation hits home. The “Swiss option” is not and never has been (not since 2009, at any rate) a viable option. To that, we could add much more – as indeed the Government does – but it would be overkill. Bilateral agreements, including the Swiss option, in the context of Article 50 negotiations, are a non-starter. Thus, we need to move on. In Part 3, we’ll look at what the Government has to say about the WTO option.